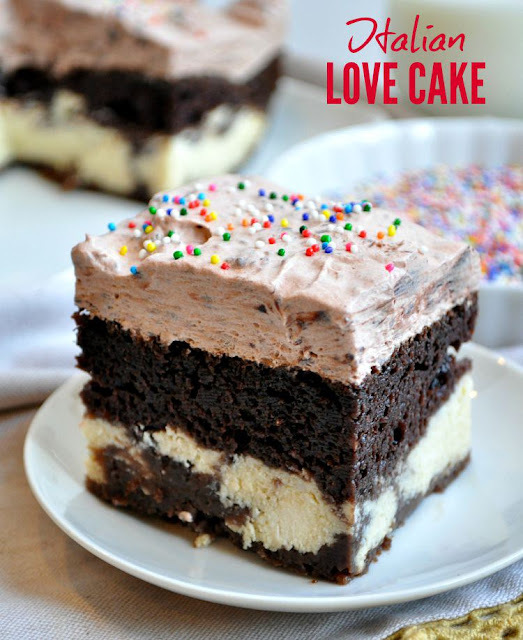 With help from a cake mix, even your kids can make this Easy Chocolate Italian Love Cake! It\\\'s a simple yet impressive dessert that everyone loves! In a large bowl, mix together cake mix according to the directions on the box. In another bowl, mix together ricotta cheese, eggs, sugar, and vanilla until smooth. Pour the cake batter into the baking dish. Spread to fill the pan evenly. Once the cake batter is in place, carefully pour the cheese mixture evenly over the top of the cake batter. Spread to cover cake as best you can (the layers will switch during baking). To make frosting, mix together pudding mix and milk with a whisk until combined. Carefully fold the cool whip into the pudding until combined. Spread mixture on top of cooled cake and cover and refrigerate at least 6 hours before serving. 0 Response to "Easy Chocolate Italian Love Cake"